The banking industry may be green when it comes to working with cannabis, but HARDCAR is establishing partnerships to help financial institutions get a foot in the industry’s door. January 30, 2019 – (Palm Springs, CA) – HARDCAR Distribution, the award-winning cannabis distribution, cannabis transportation, and cannabis security company, announced today that is has solidified yet another partnership with an established financial institution in California. 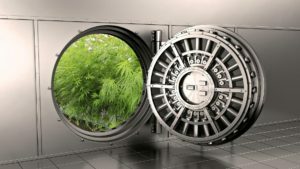 For well over a year the company has been offering cannabis banking solutions for institutions interested in working with the cannabis industry and is providing services to ensure these institutions are in compliance with state laws. In the growing number of states that have legalized cannabis, whether medicinal or recreational, regulations and solutions are imperative to keep illegal cash off the streets and help reduce potential criminal and violent activity. While the federal government has yet to regulate the exchange of currency in the cannabis industry, financial institutions have rightfully begun taking initiative. HARDCAR Distribution has now established banking partnerships with more financial institutions than any competitor, and it doesn’t plan to stop there. The cannabis industry’s leading companies, without the support of the federal government, have limited options when it comes to handing cash. Several organizations are currently resulting to vaulting, or even burying, cash earned from cannabis products or services. HARDCAR’s partnerships with financial institutions allow the company to transport cash earned from cannabis into the federal reserve. For questions or more information, please contact HARDCAR at info@hardcar.com or call 1-833-246-4273. HARDCAR is an award-winning and long-time contributor to the cannabis space, with a proven track record of cultivating and solidifying meaningful relationships throughout the industry. From packaging, to distribution, secured storage, and transport, HARDCAR Distribution has all aspects of cannabis retail covered. Through collaboration with our diversified team of highly qualified and talented professionals, we help cannabis businesses stand out in the industry by providing the highest quality industry services that keep our partners’ products safe, while maintaining excellence and compliance throughout our work.